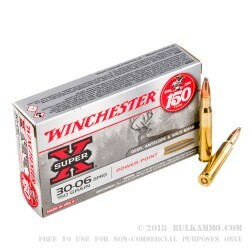 This .30-06 Springfield 150 grain Power Point ammo from the Super-X line by Winchester is a round that has been in the hunter’s arsenal for years and has been proven to take big game with a relatively lightweight bullet and solid ballistics. 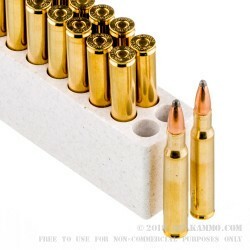 It offers hunters the type of flexibility they need when hunting anything from 200 lbs. to 1000 lbs. in the field. Deer, antelope and wild boar are all in the sweet spot for this cartridge, and while it might not be a first choice, larger game could be taken with responsible shots with this load. The impressive 2920 feet per second muzzle velocity and 2840 ft. lbs. of energy are able to ensure good clean kills on a variety of game. 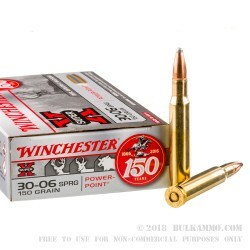 The 150th year anniversary marketing on Winchester boxes prove the point that Winchester has been doing it right for a very long time. The classic rounds like this .30-06 are the loads that built this brand after all, and the heritage Winchester enjoys with hunters all over the world is pretty incredible. 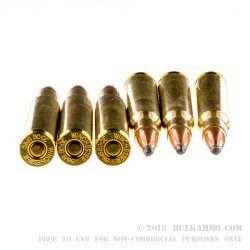 Boxer primer, with a reloadable brass casing, this round is a good value for those who want proven technology and predictable performance.